The Talking Box: Do It, Rockapella! A friend told me not long ago that she remembers the first lie she ever told her parents. I was intrigued. I have no idea what the first lie I told my parents was. I'm not even sure how old I was... I know I was lying somewhat regularly by age 9... because I lied a lot. My siblings did, too. Psychologists would probably attribute our lying to the fact that our parents lied all the time. And, we knew they lied... some were too obvious not to see through. 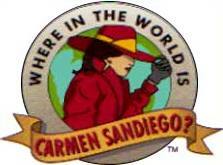 And, one specific lie I told was about Where in the World is Carmen Sandiego? I remember telling my dad that I was supposed to watch it for school. I said this so that I got to watch what I wanted, which meant my brother didn't get to see his show. This was only the second grade or so, as I followed it near its inception, which was September 1991. But I loved this show. 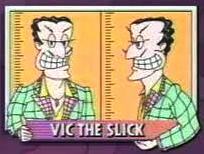 Brief history: This was a kids' game show that ran on PB from 1991-1995, with reruns continuing only a year afterward. 296 episodes were made, and one remains unaired... apparently the original girl in the final round broke her arm during taping. The show was created partly because National Geographic found out that Americans were bad at geography... one in four people apparently couldn't point out the Pacific Ocean! So, this show promoted geography to youngsters... kids aged 10-14 made up the majority of the contestants. And, the winner got to go with a parent and a guest to another location within the US for a week... sweet prize for a kids' show! After five years, the show was revamped to Where in Time is Carmen Sandiego? and several games were made based on the show as well. Oh, and perhaps one of the neatest things about the show... the theme song was sung live, by an a capella group, Rockapella. Notable changes to the way the game is played: In the first season, winners could only go someplace throughout the continental United States, but later it was expanded to allow for anywhere in North America. In seasons 4 and 5, you could pick your hotel, too. You got a rental car after the second season. The maps in the final round changes as well. Landmarks and bodies of water were added as placed you might need to identify. The US map changed to North America in Season 3. The prize money also increased several times. And, not to the way it was played, but in the way it was aired, they had to add in a little disclaimer about the "geography being accurate at the time of taping." I mean, after all, the Berlin Wall and the Soviet Union were hot geographical topics back then! 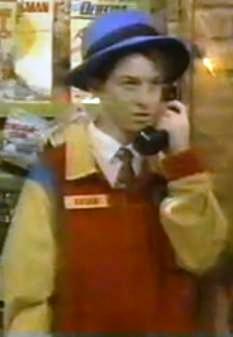 Special contestants: One episode in Season 2 had celebrity pairings, featuring Ben from Growing Pains, Ashley from The Fresh Prince of Bel Air, and the title character from Blossom. Otherwise, I can't say there there were any "special contestants," per se. Favorite Rounds: I loved "The Map." I think a lot of kids did. It was a thrilling 45 seconds, and I was often impressed with the knowledge that others had about where the teeniest countries were (like the kid that beat Africa above). I thought that the posts looked kinda heavy, though I guess they couldn't have been, in retrospect. It always upset me when the kid would fail at big US states... those should be super easy!! My take: So, while I was pretty well-versed in geography as a second-grader, by the time I could compete, I don't know how I'd compare to others my age. At 10 or 11, I was probably just above average. At 12 or 13, I could probably have been a good competitor, but I couldn't tell you for sure. My map skills for Asia and Africa in particular were weaker... I was better at knowing capitals, general locations, etc. If the game was available for adults, bring it on! I adored the geography games that were popular on facebook for a while a couple years ago, and played for hours, trying to beat the scores of my friends. Geography is undervalued in game shows... it would be nice for something similar to come on again! What about you? Did you watch Carmen Sandiego? Did you have the computer game? (I didn't, since we didn't have a pc until 1998 and it was out of style by then.) Would your geography skills have served you well on the show when you were 10-14? by Amy K. Bredemeyer at 1:29 PM Topics: Amy K. Bredemeyer, game show, Where in the World is Carmen Sandiego?